Welcome to the Easy MTD VAT help. Easy MTD VAT is a Windows application that enables you to view VAT obligations, payments and liabilities, and digitally submit VAT returns (open obligations) to HMRC in compliance with their Making Tax Digital for VAT service. Whether your business records are kept in an accounting package or a spreadsheet, Easy MTD VAT can import the required VAT figures and submit them to HMRC in just a few clicks. The Getting Started section will guide you through the fundamentals of downloading, installing, updating and specifying account details, and provides an overview of the Easy MTD VAT interface. After downloading Easy MTD VAT, install it by opening the Easy_MTD_VAT_n_Setup.exe (found in the download folder of your browser). The installation process is straightforward and you will be guided through each step. Easy MTD VAT is uninstalled using the Windows uninstall program feature. Easy MTD VAT is launched by opening the Easy MTD VAT program found on the Windows Start menu or desktop. Easy MTD VAT is sometimes updated to fix issues and introduce new features. When this occurs you will be notified about the update when Easy MTD VAT is launched or by clicking the Update option on the Help menu. The following screenshot (see fig. 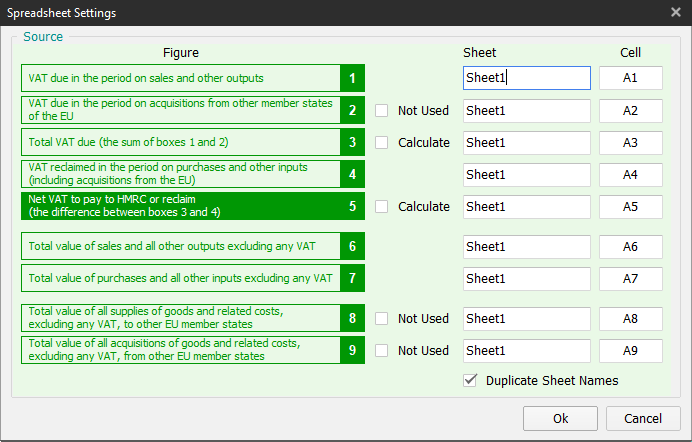 below) and table describe components of the Easy MTD VAT interface. A Title Bar Identifies the software and provides buttons to minimise, maximise and close (exit) Easy MTD VAT. B Help Menu Provides options for accessing the help, Account window and About window, checking for an update, visiting the Easy MTD VAT website and buying submission tokens. C Client Includes a Client list box for selecting a client, and provides buttons for adding, granting authority to Easy MTD VAT, modifying and deleting clients. D VAT Details Displays open obligations, fulfilled obligations, payments and liabilities for the selected client between the indicated From Period date and To Period date. Buttons are also provided to submit an open obligation (VAT return) and view submission receipts and figures of fulfilled obligations. To enable you to submit VAT returns (open obligations) you need to specify your Fly Software account email and password in Easy MTD VAT. Click the Account option on the Help menu to open the Account window (see figure below). Specify your email and password then click the OK button. If the email and password are valid they are saved and the Account window is closed. If the email and/or password is invalid, a Warning window is opened notifying you of this. 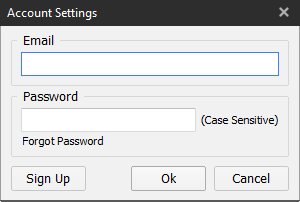 click the OK button to close the Warning window and specify the correct email and/or password. NOTE: The Account window is also opened when you attempt to submit a VAT return if an account email and password have not been specified. If you forget your password, you can reset it by clicking the Forgotten Password link in the Account window or the Login window of the Easy MTD VAT website. To view the version number of Easy MTD VAT, the Fly Software account Easy MTD VAT is associated with, and how many submission tokens you have available, click the About option on the Help menu. Following this, the About window (see figure below) is opened. Click the close button to close the About window. The term client refers to a VAT registered business for which you want to submit a VAT return and display obligations, payments and liabilities. This business can be your own or a business you are authorised to manage as an agent. To add a client to Easy MTD VAT, click the Add button. Following this, the Add Client window (see fig. below) is opened where you specify client details. Reference Identifies the client in Easy MTD VAT and is the name that appears in the Client list box. If you are an individual this will normally be the name of your business. If you are an agent this will normally be the name of your customer's business and perhaps other identifiers such as a customer number. If you are an individual this is your own VAT Registration Number. If you are an agent, this is the VAT Registration Number of your customer. It is important to specify the VAT Registration Number correctly. If specified incorrectly it prevents Easy MTD VAT being granted authority to interact with HMRC for the client. Agent Reference If you are an agent acting on behalf of one or more clients, an Agent Reference should be specified or selected so Easy MTD VAT can be granted authority to interact with HMRC for all eligible clients with the same Agent Reference. Additional Information Any other information or notes. Optional. When all required fields are specified, click the Add button to add the client and close the Add Client window. NOTE: The Add Client window is also opened when you launch Easy MTD VAT if there are no clients already added. To display client obligations, payments and liabilities, to modify and delete a client, and to grant authority for Easy MTD VAT to interact with HMRC for a client, the client must first be selected. Click the Client list box arrow, locate the client Reference then click it to select it. Alternatively, start typing the Reference to automatically populate the list box with a matching client. The VAT Registration Number, Agent Reference (if specified) and Additional Information (if specified) are displayed below the Client list box when a client is selected. To modify client details, select the client then click the Modify button. Following this, the Modify Client window (see fig. below) is opened. For details about the fields contained in the Modify Client window, refer to Managing Clients > Adding. NOTE: If Easy MTD VAT has been granted authority to interact with HMRC for the client, and the Agent Reference is changed, Easy MTD VAT will need authority granted again for the client if Easy MTD VAT has not already been granted authority for another client with the same Agent Reference. Returning the Agent Reference to what it originally was (blank or otherwise), automatically grants authority again to Easy MTD VAT for the client. Click the Save button to save any changes and close the Modify Client window. To delete a client, select the client then click the Delete button. Following this, the Delete Client window (see fig. below) is opened. Click the Delete button. Following this, a Confirm window is opened requesting confirmation of the delete. Click the Yes button to perform the delete and close the Confirm window and Delete Client window. Easy MTD VAT needs to be granted authority to interact with HMRC for each client. If authority is not granted it prevents VAT returns being submitted, and obligations, payments and liabilities being displayed for a client. How authority is granted depends on whether you are an individual submitting and displaying their own VAT figures, or an agent doing the same for its customers. Individual An individual needs sign in credentials (User ID and Password) for a Government Gateway account associated with the selected client. Performing the authority process grants authority for Easy MTD VAT to interact with HMRC for this client only. Select the client associated with your business or a client that has the same Agent Reference as the other applicable clients you manage as an agent. Click the Authority button to open the Authority window (see fig. below). 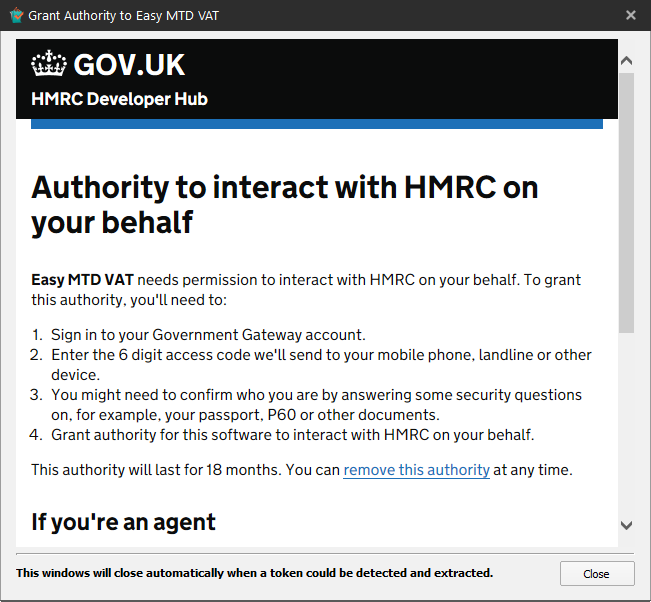 The content of the Authority window is taken from a HMRC web page. Read the notes provided then click the Continue button to open the Sign In page. Specify your Government Gateway User ID and Password then click the Sign in button. Following successful sign in, a page is opened requesting you to grant authority for Easy MTD VAT to view and change the client's VAT information. Click the Grant Authority button. If granting authority is successful, the Authority window is closed and an Authority Granted window is opened. Click the OK button to close this window. NOTE: Authority is only granted for 18 months from the current date and it can be removed at any time. NOTE: Granting authority again is permissible and it simply extends the period for which authority is granted. Click the Authority button to open the Authority window (see fig. above). The content of the Authority window is taken from a HMRC web page. Click the "remove this authority" link to open the Manage Authority page. Click the Start Now button to open the Sign In page. Follow the instructions that appear on subsequent pages. Click the Close button at the bottom of the Authority window to close the window. As long as Easy MTD VAT has been granted authority to interact with HMRC for a client, their open obligations, fulfilled obligations, payments and liabilities can be managed. Specify a From Period date and To Period date (or use the defaults). To select an open obligation so it can be submitted, or a fulfilled obligation so it can be viewed, click it. A selected item is highlighted. By default, the From Period date is 12 months in the past and the To Period date is the current date. Both these dates can be changed as required but HMRC only allow you to view up to 12 months of obligations, payments and liabilities. The default dates remain all the while they are left unchanged. 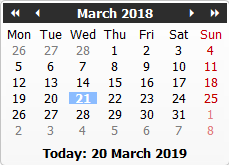 Click inside the From Period date box or To Period date box then specify a date manually (dd/mm/yyyy). Alternatively, click the calendar icon to open a Calendar window (see fig. below) where the day month and year can be selected. 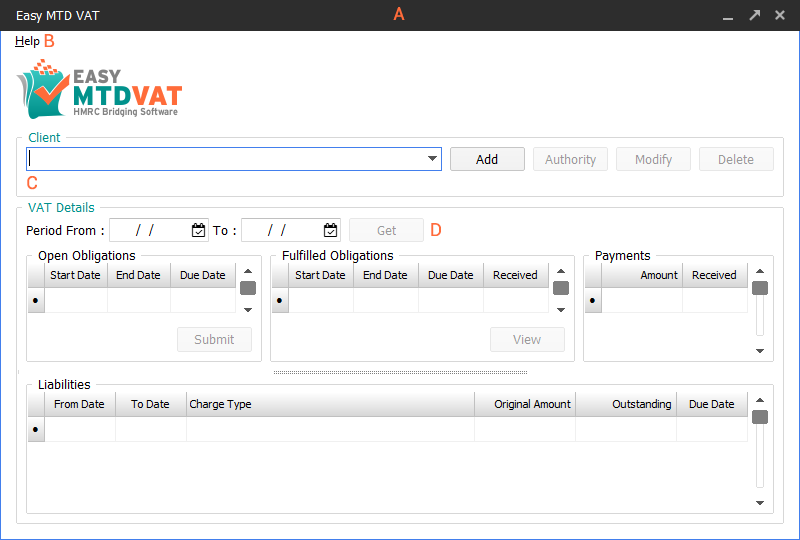 To view the submission receipts and VAT figures of a fulfilled obligation, select it then click the View button. Following this, a View VAT Return window is opened (see fig. below). Click the Close button to close the View VAT Return window. To submit a VAT return (or an open obligation as it is referred to in the Easy MTD VAT interface), select the associated open obligation then click the Submit button. Following this, a Submit VAT Return window is opened (see fig. below)*. *NOTE: If you have not already specified your Fly Software account email and password, a Warning window is opened notifying you of this. Click the OK button to close the Warning window and open the Account window (see fig. above) where an email and password can be specified. When coimplete, click the OK button to close the Account window and continue with the VAT return submission process. For further details about specifying your Fly Software account email and password, refer to Getting Started > Specifying Account Details. Click the Close button at any time to cancel the VAT return submission process and close the Submit VAT Return window. To submit a VAT return, associated VAT figures must be imported from an Excel spreadsheet or CSV file. Click the Browse button (...) to open a standard Windows browse window. Locate the Excel or CSV file where the VAT figures are stored. Select the Excel or CSV file. If the VAT figures are valid they will populate the Figures Imported panel of the Submit VAT Return window and an Import Successful window is opened. Click the OK button to close this window. 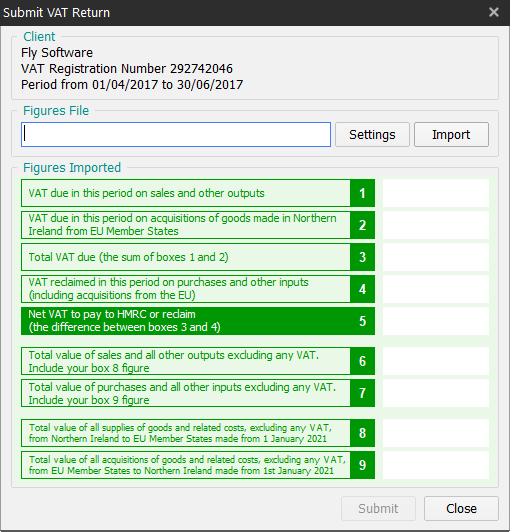 If the VAT figures are invalid, they will be highlighted in the Figures Imported panel of the Submit VAT Return window and a Warning window is opened. Click the OK button to close this window then correct the issue(s) in the Excel or CSV file before trying to import the VAT figures again. If a figures file is already specified, there is no need to locate and select it again. 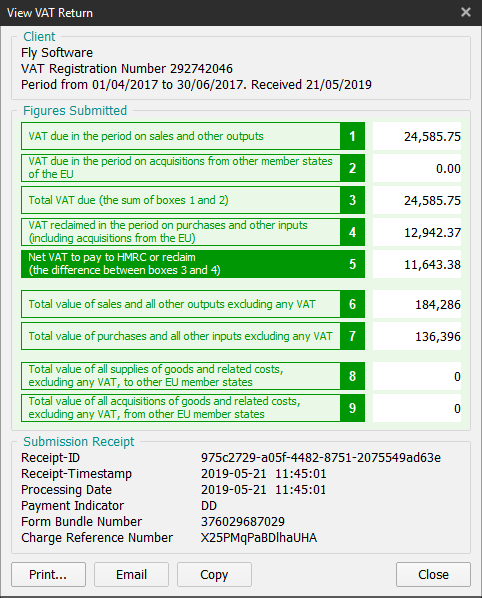 Instead, click the Import button to import the VAT figures. *NOTE: If you are importing VAT figures from an Excel spreadsheet and if spreadsheet settings have not yet been configured for the selected client, the Spreadsheet Settings window (see fig. below) is opened. For further details about configuring spreadsheet settings, refer to Submitting a VAT Return > Configuring Spreadsheet Settings. For details about valid VAT figures, refer to Submitting a VAT Return > Valid VAT Figures. For details about the CSV format, refer to Submitting a VAT Return > CSV Format. NOTE: Once VAT figures have been imported they cannot be altered prior to submitting them to HMRC. This is to conform with Making Tax Digital for VAT requirements. If you need to make a change to the figures this must be performed in the Excel or CSV file before importing them again. When VAT figures have been successfully imported, click the Submit button. Following this, a Submission window (see figs. below) is opened. The content of this window is dependent on whether you are an individual submitting your own VAT return or an agent submitting on behalf of one of your customers (i.e. an Agent Reference is specified for the client). Agree to the declaration by clicking (ticking) the check box then click the Submit button. 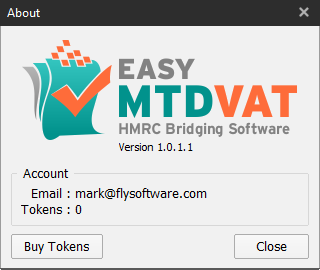 If there are one or more submission tokens available in your Fly Software account, the VAT Return is submitted digitally to HMRC and a Success window is opened notifying you of this. Click the OK button to close this window. If there are zero submission tokens in your Fly Software account (or another problem is encountered), a Warning window is opened notifying you of this. Click the OK button to close this window then purchase one or more submission tokens (or rectify the problem) before attempting to submit the VAT return again. For further details about buying submission tokens, refer to Getting Started > Buying Submission Tokens. Prior to importing VAT figures from an Excel spreadsheet, the worksheet and cell where each VAT figure is located in the spreadsheet must be specified. Use the Worksheet and Cell text boxes to specify where in the Excel spreadsheet associated figures are held. If all figures appear on the same worksheet, tick the Duplicate Worksheet Names check box so the name of the worksheet only has to be specified once in any of the Worksheet text boxes. When all worksheets and cells are specified, click the OK button to save the settings and close the Spreadsheet Settings window. NOTE: Spreadsheet settings are associated with the selected client meaning each client has their own spreadsheet settings. *NOTE: The Spreadsheet Settings window is also opened when you import VAT figures from an Excel spreadsheet if spreadsheet settings have not already been specified for the associated client. 1 VAT Due Sales 2 or less decimal places. 2 VAT Due Aquisitions 2 or less decimal places. 3 Total VAT Due Sum of 1 + 2. 2 or less decimal places. 4 VAT Reclaimed For Current period 2 or less decimal places. 5 Net VAT Due Either 3 - 4 or 4 - 3 - whichever produces a positive value. 2 or less decimal places. 6 Total Value Sales Ex. VAT Whole number. 7 Total Value Purchases Ex. VAT Whole number. 8 Total Value Goods Supplied Ex. VAT Whole number. 9 Total Acquisitions Ex. VAT Whole number.